The Plain Tiger is a common urban species that has been spreading around Singapore's parks and gardens ever since its caterpillar host plants, Calotropis gigantea and Asclepias curassavica, have been cultivated as butterfly-attracting plants. Back in the 1990's, the species was relatively unknown in the urban environment. Today, it can be considered to be abundant in the vicinity of butterfly gardens where its host plants can be found. A medium-sized and colourful butterfly, it flies slowly and will usually not go unnoticed by the casual observer visiting our parks and gardens. 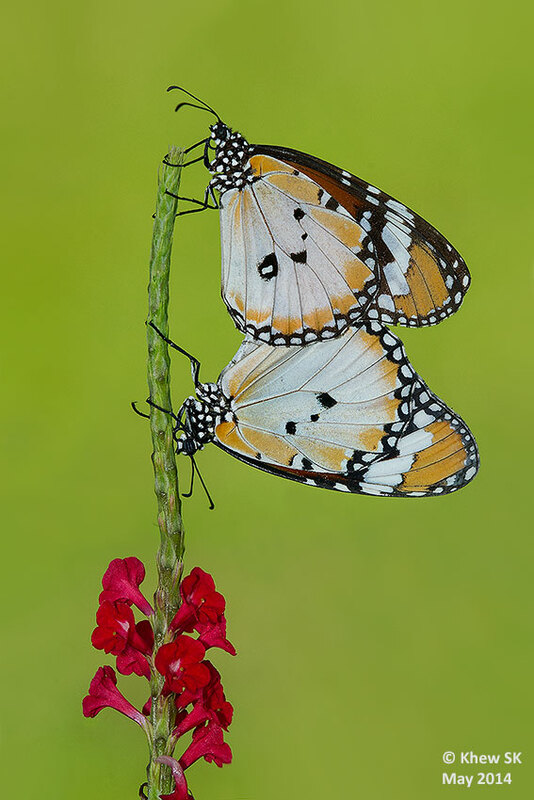 The mating pair perched on the red cultivar of the Snakeweed (Stachytarpheta indica), shows the male (top) and female (bottom). Note that the male Plain Tiger has an extra black spot on the hindwing. This mating pair was shot yesterday at the Gardens By the Bay's open butterfly garden.